I recently released my first game, Next Word. Next Word is a party game that tests your ability to describe words, and your teammates ability to guess them. 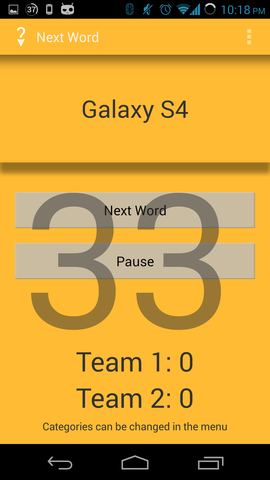 Players are given a random word from one of three categories, and must try to get their teammates to guess what the word is. 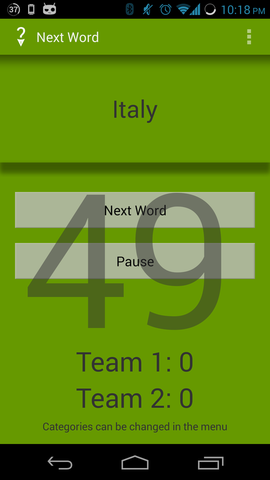 After the 50 second timer runs out, the last team to successfully guess a word gets a point. The app is still in beta so I'm very open to feedback, and I'm always looking for suggestions for more categories, better UI enhancements, etc. If you have any feedback at all, please comment below, or PM me. Interesting idea for a quick time killer. Hope it does well in Play.